Hyperactive Monkey is releasing a shiny new colorway of their adorable Monkey Kung Fu Sofubi Chubs exclusively at Designer Con 2016. Check out those super shiny chubby cheeks! 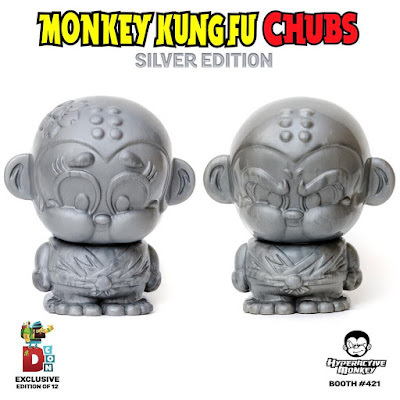 For Designer Con 2016, Shao Lu and Shao Mei, the Monkey Kung Fu Sofubi Chubs, have been cast in metallic silver soft Japanese vinyl. Both figures are articulated at the head and stand 4.5” tall. Collectors can pick up these awesome figures at the Hyperactive Monkey DCon booth #421.